Odds are, if you've heard a story about the South Side Chicago neighborhood of Englewood in the news recently, it had something to do with crime or poverty. Indeed, Englewood ranks among Chicago's five most violent neighborhoods and has a high unemployment rate as well as a median household income far below the city average. These facts are not lost on 30-year-old Rashanah Baldwin, a lifelong Englewood resident and local journalist. But that's not the full story. Earlier this year, Baldwin launched a new weekly segment called "What's Good in Englewood" that runs every Tuesday morning at 10 a.m. on WKKC, Kennedy-King College's radio station. Through the segment, Baldwin aims to spotlight the positive side of the much-maligned enclave she calls home. She says she won't be running short on stories highlighting the hopeful elements of her neighborhood anytime soon. "The portrayal of Englewood I see on TV is not the community I live in. Every day, I'm walking outside to the gym, to the cafe, going to work," Baldwin told The Huffington Post. "It's not what you think. I'm trying to convince people that there is hope here and it is a place where you can raise a family." 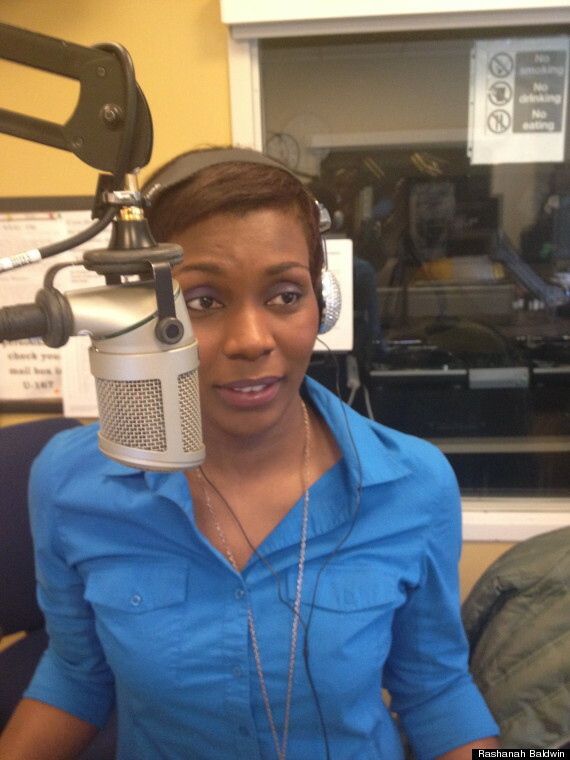 Rashanah Baldwin recording a "What's Good in Englewood" segment. Frequently, Baldwin says, when news crews come to Englewood, it's only in response to a shooting and the only interviews of residents that make it on air are quick man on the street segments. When news crews attempt to go deeper, their coverage can also fall short, she says, such as when a program that teaches young residents web programming and how to build a website is summarized as a program that merely teaches youth how to use computers. In another story, a local news reporter spent 12 hours overnight in the neighborhood, calling the night hours "when the crazy comes out" and documenting the fallout from multiple violent crimes as they happened. Englewood wasn't always this way. In the 1920s, the neighborhood was home to Chicago's second busiest shopping district, located at Halsted and 63rd, and its population had swelled to over 86,000 before topping out at almost 98,000. In the 1940s, real estate values dipped in the area and disinvestment soon followed. Major retailers left, reinvigoration efforts flagged and, by 2010, the neighborhood's population had dwindled to about 30,000. Many lots sit empty and homes vacant. Still, Baldwin finds hope in plenty of places in Englewood these days, and tracks those glimmers of hope using the hashtag #goodinenglewood on social media, encouraging others to do the same. Recent stories on Baldwin's segment include a feature on four students at Lindblom Math & Science Academy, a public selective-enrollment school, who were recently named Gates scholars and received full college scholarships. 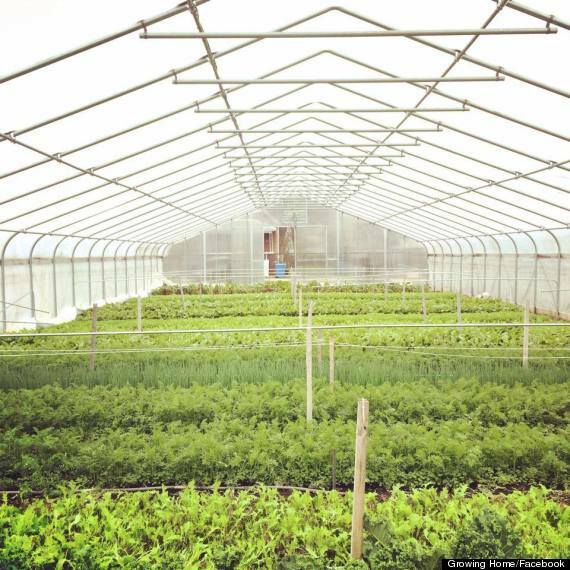 Another centered on the weekly farm stands taking place beginning next month at Growing Home's Englewood-based urban farm, an organization that also offers job training. Growing Home's urban farm on Wood Street in Englewood. In another story, Baldwin featured the work of the principal at Wentworth Elementary, the Chicago Public Schools grade school she attended. There, the principal has created an open door policy allowing for successful adult African-American men from the community to come into the school and talk to classes, similar to a career day. While Baldwin will be the first to admit that violence and poverty have impacted her neighborhood more than others in the city, she describes those trends as the product of the lack of resources available to area residents. Her challenge is to get others -- both inside and outside the neighborhood -- to recognize that and, she hopes, be inspired to help change it. "I know there is much more work to be done still, but I want people to realize it's structural. It's been set up this way," she told HuffPost. "We don't need saving. We're not a social service community. It's good that you want to help, but help by giving us resources, not more services." The journalist's efforts have not gone unnoticed. She said she's received many story idea submissions and has also gotten a wave of media coverage, including a front-page feature on the Chicago Tribune. While she's thrilled to have the platform of WKKC, she hopes she can one day continue her work at a larger radio station, on television or in print. Meanwhile, Baldwin's work continues. She tells her stories not only through the radio segment, but also through her work as a multimedia consultant for the community organization Teamwork Englewood and a founding member of the Resident Association of Greater Englewood (R.A.G.E.). She also manages the Englewood Community Portal, a neighborhood news website, and launched a speakers series called "Shop Talk," with monthly events at Powell's Barber Shop on 63rd Street. The common goal of "Shop Talk," the radio segment and much of Baldwin's efforts, she says, is connecting the South Side community's assets in order to discuss solutions, instead of being crippled by the steady stream of bad news that dominates the mainstream portrayal of the neighborhood. "Don't believe everything you hear," Baldwin said of those headlines. "Yes, someone got shot yesterday and someone will probably be shot tomorrow, too. That happens in every urban community around the world. That's an issue we have to change and we have to become the leaders and become those assets to change it. We're going to create peace."